Is Zero Waste Truly a Viable Option at Trade Shows? Going zero waste can be a pretty intense challenge and studies have shown that most people feel it is simply not possible to exhibit at a trade show and maintain a zero waste impact. 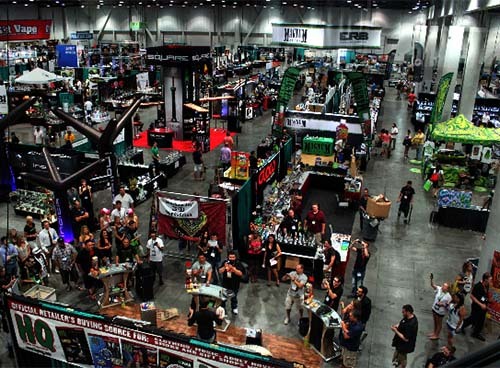 Trade shows are notorious for the amount of trash generated. Between packaging, samples and handouts, there are so many items and materials that may get abandoned at the end of the show. As exhibitors travel a significant distance to trade shows, they may not want to ship the materials back to their home office to save money. This is disappointing, but as I recently broke down for a post on TSNN, it is very possible to attain close to a zero waste impact while exhibiting at a trade show. Read on to get my tips for going zero waste at your next trade show. Recycle Everything Possible – It is relatively easy to recycle paper, glass and metal, so keep doing that, but don’t overlook all of the other materials that can be recycled, like fabric, wood and electronics. Do some research to learn where and how you can recycle some of these other materials, or find a local recycling organization you can work with and will help recycle some of those trickier materials. Only Source Materials That Can Be Recycled – When designing your booth and determining what items are needed, think about the end game and choose materials that are recyclable. It will be a lot easier for you to achieve tip #1 above if you choose materials that can be recycled from the start. Think Long Term – When creating your trade show booth, plan to use items for several years. Of course you want your booth to look on trend and relevant, but if you reuse items, you can help the planet and keep costs down. It is easier to reuse items like framing, flooring and larger furniture pieces, but plan to commit to these items for a while. Hold a Sale or Donate Items That Are No Longer Needed – A lot of furniture and decorative items used in trade show booths are only used during trade shows, so you may use it for several years, but if you only exhibit at a few shows a year, these items won’t have a lot of wear and tear on them. When you want to change things up, you may not need these items anymore but that does not mean these items don’t have some life left in them. If the condition of the items is acceptable, hold a sale of leftover furniture, flooring and electronics for your staff, put things up for sale online or donate items to local shelters, or charitable organizations. See tip #1 for any items that are not in good enough condition to sell. Evaluate Your Company’s Eco Impact – Analyzing results is not very fun or glamorous, but this is a very necessary step in order to determine the full extent of your environmental impact and what areas need improvement. It is key to look at the big picture, so examine everything from planning through following up after the show to identify where you succeeded and where you can do better. It isn’t easy to go zero waste and there are a lot of things to consider and be aware of, but with careful planning it is possible to attain close to zero waste while exhibiting at trade shows. Do you have tips or tricks to go zero waste? We would love to hear them and may use your ideas in a future post so please let us know in the comments! What is Green Marketing and Is It Right for Your Brand?